To add a new project we enter the home page, then click on the Add a new project. 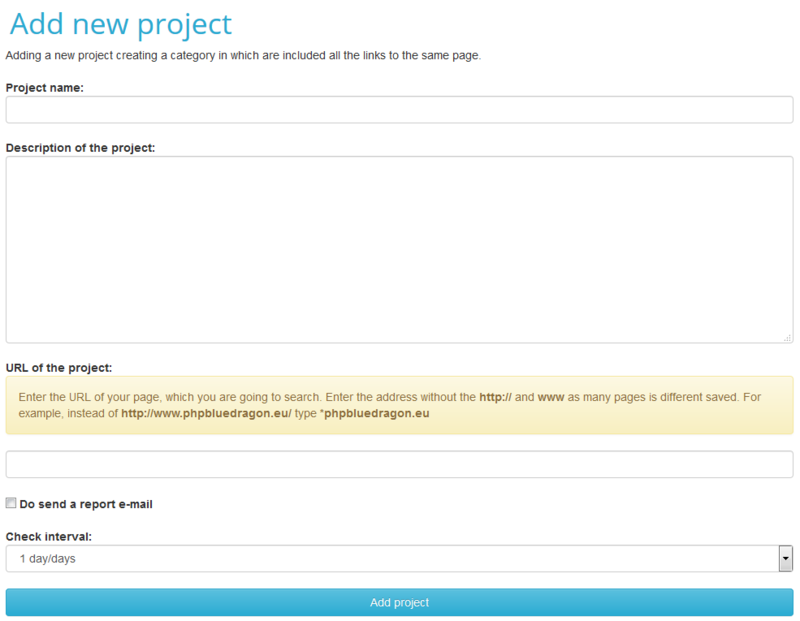 Project Name box is used to define its name after which you will be able to figure out what contains a category. Field Description of the project is to enter the text helps to identify what elements are in it. The URL of the project is designed to address our part that we are going to check. Due to the different possibilities of placing it, and the presentation on the web the best in this case would be to use an asterisk (*) in the most sensitive areas. For example, the address to our site is http://www.phpbluedragon.eu/. Unfortunately, we do not know how it was put on the foreign pages. Their authors could put the address: http://phpbluedragon.eu/ or www.phpbluedragon.eu or http://www.phpbluedragon.eu. Because we do not know in what form it was placed would be best if you type in the address field using asterisks: *phpbluedragon.eu* - star to replace any string of characters. As a result, we have confidence that if the address is on the side of the system will surely find him. The next box you send e-mail report determines whether the report apart from generating on the server also has to be sent to our e-mail. In the Frequency to check every set number of days you want to run the CRON automatic checking. It is best to set a period of 3 days. Once the form is complete, click on the Add button.